Global warming and climate change leads to neanderthalisation of the species and a changeover to neanderthal metabolonomics. Stress of global warming led to the induction of HO1. This results in heme depletion. Heme depletion induces ALA synthase and results in porphyrinogenesis. The archaea can catabolize cholesterol to digoxin, a steroidal hormone. The archaea and its antigens induce HIF alpha and activate the glycolytic pathway. The glycolytic pathway activation induces increased conversion of glucose to fructose by activation of the sorbitol pathway. Glucose is converted to sorbitol by the enzyme aldose reductase and sorbitol is converted to fructose by the action of sorbitol dehydrogenase. Fructose is phosphorylated by hexokinase or fructokinase to fructose phosphate. Hexokinase has a low km value for fructose and minimal amounts of fructose will be converted to fructose phosphate depleting the cellular ATP. ATP is converted to AMP and by the action of AMP deaminase is converted to uric acid. Thus there is resultant hyperuricemia and the depletion of ATP also produces membrane sodium potassium ATPase inhibition. 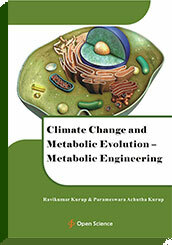 Climate change can induce lasting metabolic evolution.